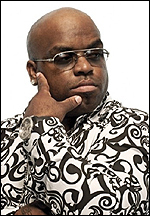 I think we can all agree right here and now that Cee-Lo Green's F**k You is the single of the year. In fact, there is no need for anyone else to release anything else until 1st January, when we reset the tallies and start all over again. However, I'd missed that F**k You (or "FU" as the artwork has it) wasn't Cee-Lo's first release from the forthcoming Lady Killer album. Earlier this summer, he put out a cover of Band Of Horses' desperately romantic No-One's Going To Love You. On this Paul-Epworth produced version, Cee-Lo substitutes the chiming guitars and plaintive harmonies for epically symphonic synths and an urgent, passionate vocal. He's so determined to express his devotion that his voice begins to distort and disintegrate, ripping holes in the melody. Wherever or whoever this girl is, she's going to know that Cee-Lo has a serious jones for her*, by the sheer brutal force of his delivery. It's the equal of anything Marvin Gaye ever recorded. * This is an actual thing that people say, right?